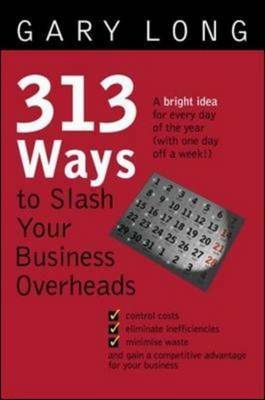 "313 Ways to Slash Your Business Overheads" is a comprehensive tool kit of cost-cutting ideas and strategies for every working day of the year. For many small businesses keeping costs down is a constant challenge. When competition is high and sales are low, the challenge becomes an urgent necessity. "313 Ways to Slash Your Business Overheads" provides small-business decision makers with practical ideas for reducing operating expenses and consequently, increasing profits. Accessible and easy to follow, the book features clearly written case studies and practical examples to allow for more problem-free understanding and implementation. Bulleted cost-saving strategies and eye-catching tip boxes increase the usability of the book, which covers areas including managing expenses, purchasing, staffing, inventory and stock control, telecommunications, technology and more.